Coryanthes alborosea opening at the Atlanta Botanical Garden. Coryanthes alborosea one half hour after opening. The right-hand flower of Coryanthes alborosea. Note the liquid already accumulating in the bucket. 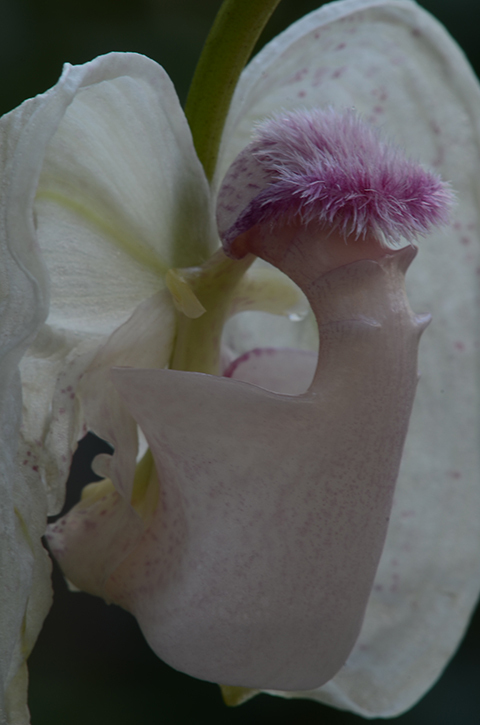 If you arrive at the Fuqua Orchid Center greenhouses early in the morning you can sometimes catch a Bucket Orchid (Coryanthes) bud in the act of opening. The bud looks like an enormous wrinkled chrysalis. It usually takes a couple of hours to fully open. First, the bud splits lengthwise along its seam, then the petals and sepals reflex backward to reveal the amazing lip. Coryanthes flowers only last about three days. 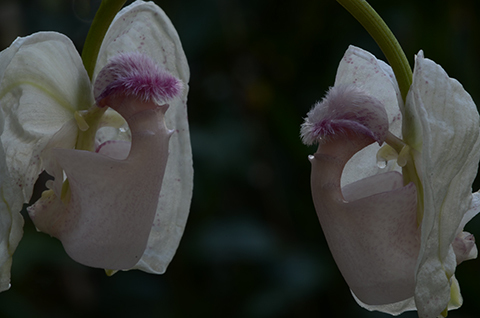 Wednesday morning I photographed a pair of Coryanthes alborosea flowers as they opened. The half-opened sepals framed the lip like angel wings. 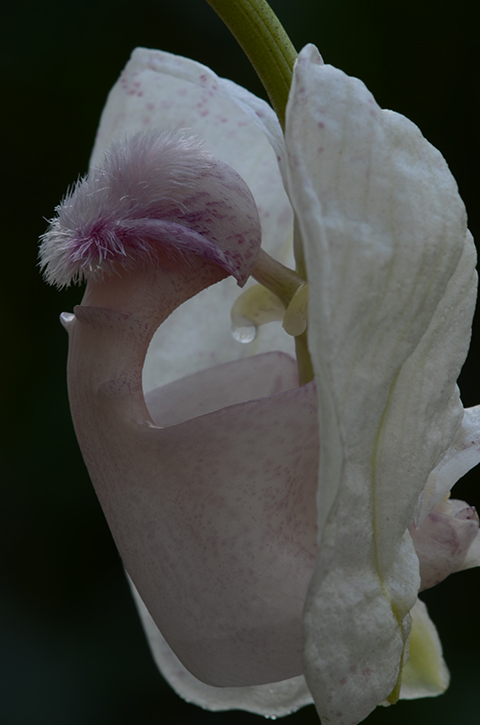 Click here to find out how a Coryanthes flower works. Yes, the colors are wonderful! We have about a dozen seedlings. All have the mop top, but varying degrees of rosy coloration, some quite intense. All of them are gorgeous. I will post more pictures as they flower. Thanks for your comment! Love the "mop top"...what a splendid and gorgeous orchid! So glad you've kept up with this blog...I really do look forward to its content. I've learned so much here!